Wednesdays are big days here in Blog Land! 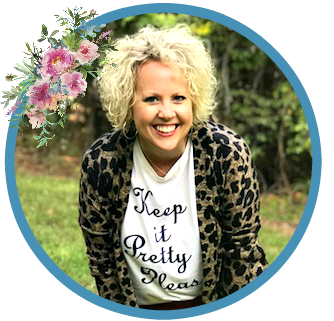 I'm following the prompts and joining Anne today for her Currently linkup, but I'm also joining Lindsay for Welcome Wednesday, and The Blended Blog because I'm actually sharing something I'm wearing for fashion Wednesday. If you're new here, welcome! 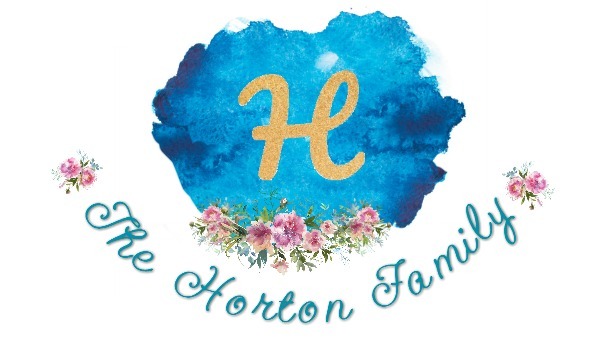 And thank you for taking time out of your day to read our family blog. Leave me a comment! 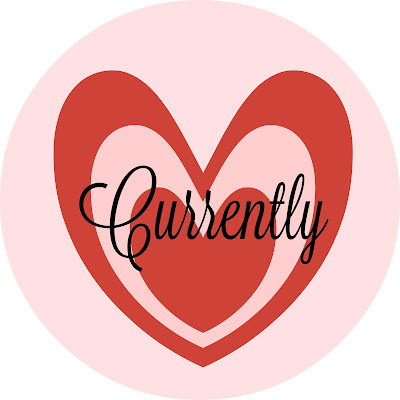 I would love to connect with you and say Hi! anticipating || We have been waiting on pins and needles for three weeks for Alise to finally get her braces off and yesterday was the day! Now, let me back up. Her daddy and I are the ones that have been waiting because in case you didn't know, it's the latest middle school fashion sensation to HAVE braces. Yes, you read right. Alise was not looking forward to getting them off, but doesn't she look beautiful?! 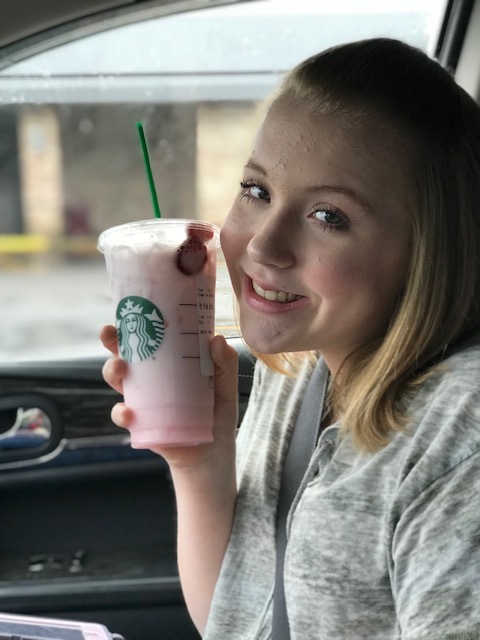 This Mama is still a little sentimental about it because we have passed yet another rite of passage of the teen years, but that smile makes me smile. We celebrated ALL DAY yesterday with a Mama/Daughter Day! going || I'm headed to a Galentine's Day Brunch this weekend and my contribution is chocolate covered strawberries! My schedule this week is not allowing me the extra time to make these suckers in time for the soiree, so I ordered them instead. And for you smarty pants that are thinking, Aha! No-spend February, remember? Well, I placed the order in January! Ha! making || Y'all. While Wayne was on leave from work this past summer recovering from his heart attack, he started working on Alise's vanity. Then, oh, about September, the project got canned over the building of a Taj Mahal DEER STAND!! It's now February and I am happy to report that the built ins are finished, the mirror and lights are up, and we are just waiting for granite and knobs. We are oh-so much closer to finishing her bedroom renovation and it looks beautiful! Excuse the mess. watching || We had quite a ride for a basketball game a few weeks ago, so I took Alise's ipad with me and watched Dumplin' while Wayne drove to Mississippi. Y'all! I loved it! So much so that I cried throughout the entire thing! Have you seen it? Seems like everyone in Blog Land is giving it two thumbs up, too. 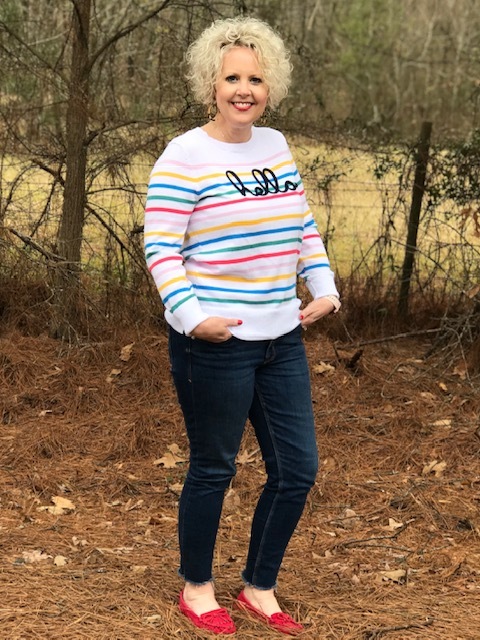 wearing || Last month, I found this cute rainbow sweater at Walmart for under $12. It's the Time & True brand, which I love and I'm hoping this thin, colorful piece will carry me into the beginning of Spring. You may remember I wore a similar sweater (from Old Navy) last month with my Nashville gal pals. I just adore these sweaters because they're perfect for my ever freezing office and cool spring mornings! I'm usually a cardi queen, but throwing on a simple, light-weight sweater and walking out the door is just too easy. Last call for 3 Things writing prompts THIS coming Monday! 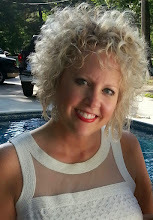 I hope you will join me and so many of my friends that will be writing right along with me! Oh look at Alise with those braces off! She is beautiful! I love that y'all spent the day together, how special! I have to see Dumplin - haven't yet but keep hearing about it. And that makeover for Alise's room? Spectacular! Your striped sweater is perfect on you - love it! Hello cutie pie! And look at that beautiful girl without those braces, so much cuteness going on in the Horton family! I also would like some of those chocolate covered strawberries! Can you believe I still haven’t seen Dumplin either, I must I must! Love you girl, have a sunshiny day! She looks so grown up without the braces! That's so funny about the teen's thinking braces are "cool." Love the colorful sweater, and I STILL haven't watched Dumplin'! Such a cute sweater! I loved Dumplin' too. And am also doing a no-spend month, but I might have snuck in an order at the very end of January too... HA! Yay to braces off! Beautiful smile. I've worn the heck out of that sweater and get tons of compliments every time I do! Thank you so much for sharing with me!!! Yay! I'm so glad, Holly! Haven't worn mine yet, but I hope to soon enough! OK - loving that sweater! & mercy me - how much your girl looks like you - especially with that fresh smile. & can I say, I'm a little jealous of that make up area!!!! Hanna Beth got her braces off last week too but she'll have another phase in about 4-5 years. Ugh! But, her teeth are beautiful. Love that cute sweater and I never seen anything like that at our WM but maybe I'm not looking close enough. Good job on the vanity! Alise will enjoy that and even more because her Daddy built it. I can not wait for the day my son gets his braces removed (and since we homeschool he's totally unaware of how cool it is to have them on and he's just as anxious to get them off). Unfortunately, he's still waiting on a few baby teeth so it will be some time before we can get them off. 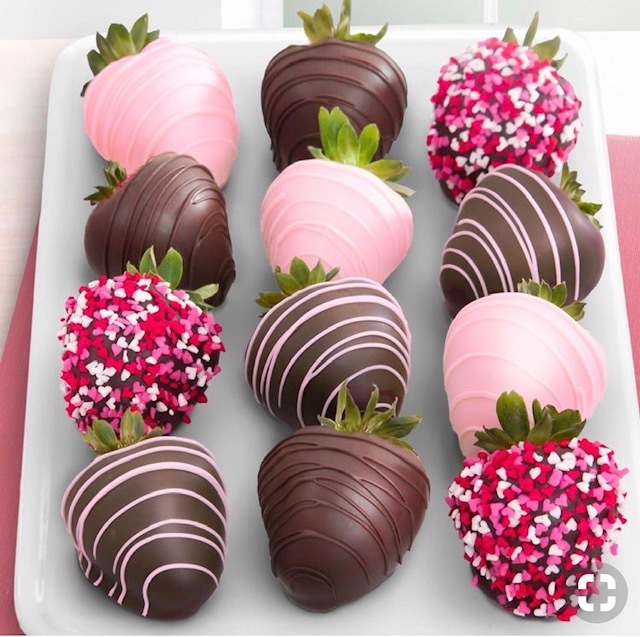 Those chocolate covered strawberries look amazing! 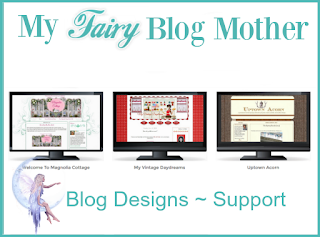 Hi Laura, I am new to your blog! I look forward to reading more of your posts. I love how cute and cheerful you look in the hello sweater p. I will be joining in and doing the 3 Things post for next Tuesday since I co-host a blog party on Mondays. Have a nice day and week. Hi Julie! Thanks so much for stopping by and saying Hi! 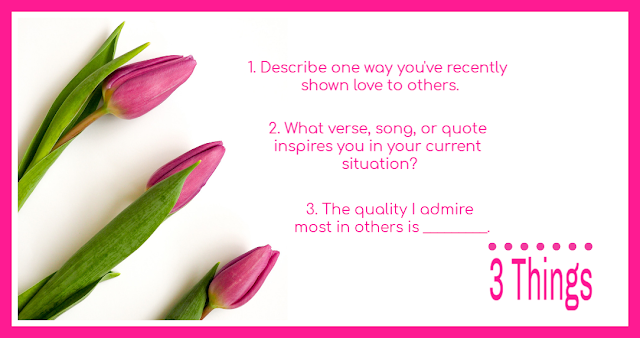 And I look forward to reading your answers for 3 Things! Headed over to your blog now! What a doll baby with her pretty smile. I had one daughter who really wanted braces (and needed them) and one who didn't want them (needed them and got them anyway). It really is a rite of passage when they come off. Had a good giggle about you ordering the strawberries in January. Aren't you clever. I just read your post about saving money, said I was trying to save, too, and then promptly signed us up for a romantic getaway weekend. Ha! I am terrible. I am seeing Dumplin' mentioned everywhere. Is it a movie or a series? I have two series that I watch while I iron. I need to finish something before I start something new. But will keep Dumplin' in mind. Alise's vanity is lovely. And even more special because it was handmade with love. I really liked the movie Dumplin', and you can't go wrong with Dolly Parton music. :-) Oooh a Galentine's Day Brunch sounds awesome. I do love me some chocolate covered strawberries. Day 6 of no spending ....I love a good challenge! Alise is just gorgeous and isn't that funny that now kids WANT braces. Looking gorgeous in that cute sweater!